(1) "Vegetable-type soybeans" refers to certain large-seeded soybean varieties developed for use as a vegetable crop. (2) "Green vegetable soybeans" refers to vegetable-type soybeans harvested at the green stage for use as a vegetable. The beans can be cooked and served in or out of the pods. (3) "Edamamé" is the Japanese term for green vegetable soybeans cooked and served in the pods, often as a snack - like peanuts in the shell. The green beans are popped out of the pods directly into the mouth of the person eating them. Before 7th century B.C. - The Shijing (Book of Odes) is China's earliest classic and the world's earliest document that mentions the soybean, which it calls shu. It does not mention green vegetable soybeans. Zheng Xuan (Wade-Giles: Cheng Hsuan), the most important commentator of the 2nd century A.D., confirms that shu refers to the soybean and that soybean leaves, called huo, can be pickled - presumably when green, then presumably eaten. A.D. 100 - The term Sheng dadou [Chinese characters: raw/fresh + large + bean] appears in both Shennong bencao jing (Classical pharmacopoeia of Shen Nung) and later (about A.D. 450-500) in the Mingyi bielu (A critical record of famous doctors. A materia medica). However a careful analysis of the context by a Chinese scholar who is an expert in the history of Chinese foods and of soybeans (H.T. Huang, PhD) indicates that this term refers to raw soybeans rather than fresh green soybeans. Therefore, surprisingly, we know of no early reference to green vegetable soybeans in China. 1406 - The Ming dynasty famine herbal titled Jihuang bencao, by Zhu Xiao is the earliest Chinese document seen that describes: (1) eating the tender leaves of soybean seedlings (doumiao); (2) eating the whole pods of young soybeans, (3) eating green vegetable soybeans; (4) or grinding the green beans for use with flour. The last three uses are recommended for times of famine only. 1620 - Maodou (Chinese characters: hairy + bean) are first mentioned in the Runan pushi [An account of the vegetable gardens at Runan], by Zhou Wenhua. "Maodou has green, hairy pods. It is also called qingdou ('green beans).' It is mentioned in the Bencao [materia medica] literature [we are not told which book], which states that it has a sweet flavor, is neutral, and non-toxic. It can be used medicinally mainly to 'kill bad/evil chi.' It stops bodily pain, eliminates water [reduces edema], dispels heat in the stomach, reduces bad blood, and is an antidote to poisonous drugs... Boil the beans in the pods until done, then remove the beans from the pods and eat them. The flavor will be sweet and fresh. Or you can remove the beans from the pods before cooking, then cook the beans in lightly salted water. Or the beans can be placed on a metal screen over a charcoal fire to roast or dry them... They can be served with tea or fruits, as a snack." This is also the earliest document seen that gives medicinal uses for green vegetable soybeans. 1855 April 12 - T.V. Peticolas of Mount Carmel, Ohio, is the first Westerner to mention green vegetable soybeans. In an article on soybeans in the Country Gentleman (p. 12) he writes: "They are inconvenient to use green, being so difficult to hull." 1856 - Only a year later, at least two Americans have apparently figured out how to shell them with ease, and to enjoy them. Thomas Maslin of Virginia writes: "They are fine for table use, either green or dry..." Abram Weaver of Bloomfield, Iowa, praises them in the Report of the Commissioner of Patents, Agriculture (p. 256-57). "I had some of them cooked, while green, at their largest size, and found them delicious." 1890 Dec. - The first large-seeded vegetable-type soybean variety arrives in America. Named Edamamé, it was introduced from Japan by Charles C. Georgeson, who had been a professor of agriculture in Japan. Other early large-seeded varieties included Easycook (introduced in 1894 from Shandong Province, China) and Hahto (1915, from Wakamatsu, Japan). 1915 Jan. - William J. Morse (of USDA's Office of Forage Crop Investigations), the man most responsible for introducing green vegetable soybeans and vegetable type soybeans to the United States, mentions them for the first time in a USDA special publication titled "Soy beans in the cotton belt": "The green bean when three-fourths to full grown has been found to compare favorably with the butter or Lima bean." 1917 - During World War I, USDA researchers conduct cooking tests on many soybean varieties in search of an inexpensive source of protein that lacks the typical unpleasant beany flavor and will cook quickly. Only two such varieties are found - Hahto and Easy Cook; both are large-seeded. Some progress is made in convincing Americans to eat these varieties - but only as whole dry soybeans. 1923 March - The Soybean, by Charles V. Piper and William J. Morse, published by McGraw-Hill (329 p.), is the first major book written about this plant in the United States. It contains a long section titled "Immature or Green Soybeans" (p. 221-22) that includes a description, nutritional analysis, recipe ideas. It also includes the first photograph in a U.S. publication of green vegetable soybeans, showing many cooked, open pods on a white plate. The caption reads: "Seeds and pods of the Hahto variety of soybeans, the seeds being especially valuable as a green vegetable." Between 1915 and 1929 Morse mentioned green vegetable soybeans in more than 20 publications. (1) Soybeans are widely "used as a green vegetable" or as "green vegetable beans," served in the pods. (2) The seeds for these soybean varieties are sold by horticultural seed companies, are listed with the garden beans in their seed catalogs, and are larger and sweeter than regular soybeans. On 24 April 1929, while in Tokyo, Dorsett made the first edamamé purchases, seven varieties with "Edamame" in the varietal name from T. Sakata & Co. They eventually collected more than 100 varieties of large-seeded vegetable-type soybeans (other suppliers included Yamato Seed Co. in Tokyo) and had them grown for a year at USDA's Arlington Farm in Virginia. (3) Edamame account for less than 1% (actually 0.8%) of all the soybeans used in Japan. (4) Green soybeans are salt-pickled in the pod in Hokkaido, the northernmost main island. (5) The soybean seeds are planted at intervals of several weeks in the same field, then, when ready, the plants are uprooted and sold in bundles. On 15 July 1929 Morse wrote: "Saw many plantings of soybeans from just coming up to ready to pull for market. It is extremely interesting to note how they are planted for succession. We saw many plantings of beans ready for pulling for market with rows interplanted as seedlings or transplants just coming into bloom." Near Tokyo, three crops of vegetable soybeans are grown during the season - early, medium and late season. The 8,000-page typewritten report is interspersed with many photos of green vegetable soybeans at various stages from the farm to the table. 1929 July 20 - A letter from William Morse in Tokyo is read before the attendees at the Tenth Annual Meeting of the American Soybean Association in Guelph, Ontario, Canada, and later published in the Proceedings of the American Soybean Assoc. (Vol. 2., p. 50-52). It is the first publication in which Morse describes his many new discoveries concerning vegetable soybeans. 1931 Jan. 3 - Morse writes in his log in Tokyo: "At one of the department stores, in the vegetable market section, we found small bundles of soybean sprouts and also some bundles of green vegetable soybean plants." This is the earliest document seen that contains the term "green vegetable soybean(s)." 1934 - Vegetable-type soybean varieties that yielded well at Arlington Farm are sent to many state agricultural experiment stations for further trials. In addition, extensive investigations of the cooking qualities and composition of the green shelled and dry edible soybeans are conducted at various departments of home economics. The green beans are found to be one of the most nutritious vegetables ever analyzed. 1935 Dec. - Dr. John Harvey Kellogg of Battle Creek, Michigan, is the first person on record to can green vegetable soybeans, or to consider harvesting them mechanically. In a letter dated Dec. 9 he writes to William Morse at USDA. "We have been doing some experimenting this year with growing and canning shell soy beans. I am having a couple of cans sent you so you can see what our product is like. We think it is very fine. The few thousand cans we put up went off like hot cakes... One of the difficulties in the way of the soy shell bean business is the expense of picking from the vines and shelling the pods. Do you know of any machinery that is used for either of these purposes?" 1935 Aug. - Rokusun, the first vegetable-type soybean is mentioned in a U.S. publication - followed in March 1936 by Bansei, and Chusei. These soybeans are now publicly available in the U.S.
1936 April - A 2-page leaflet titled "Soybean introductions named in January 1936" is published by the USDA, Bureau of Plant Industry, Div. of Forage Crops and Diseases. It is the first official publication in which varietal names are given to the new vegetable type soybeans introduced by Dorsett and Morse from Japan and tested at USDA's Arlington Farm. Twenty varieties suitable for use as a "green vegetable" are listed, together with their seed color, days to maturity, and region of the USA best suited for production. This is the earliest English-language document seen that mentions the following vegetable-type varieties - all with Japanese names: Chame, Fuji, Goku, Hakote, Higan, Hiro, Hokkaido, Jogun, Kanro (in USA), Kura, Nanda, Osaya, Sato, Shiro, Sousei, Suru, Toku, and Waseda. It is also the earliest document seen in which soybeans are classified by use as "green vegetable" or "dry edible bean" or both. 1936 July - Green Shelled Soy Beans (canned) are first sold in the USA by Dr. John Harvey Kellogg's Battle Creek Food Co. in Battle Creek, Michigan. This is the earliest known commercial green vegetable soybean product in the USA. 1936 Oct. 30 - A long article titled "Canning green soy beans," by Corinne Loskowske, appears in the Herald, published by the students of Henry Ford's Edison Institute. They have mechanized the canning process. They canned and sold 500 cans in 1935 and 1,000 cans in 1936. Similar canned green soybean products soon follow: 1939 - Mother's Choice Brand Green Vegetable Soybeans (Canned), by the Fox Valley Canning Co. of Hortonville, Wisconsin. 1939 March - "Eighteen Varieties of Edible Soybeans," by J.W. Lloyd and W.L. Burlison is published at the University of Illinois Agricultural Experiment Station, Bulletin No. 453. The 58-page report is the most detailed and interesting to date, being based in part on comments received from 1935 to 1938 from more than 685 home gardeners, market gardeners, and canners in Illinois. The university offered to send free seed and growing instructions to any gardener who would test the green soybeans and submit frank comments in writing. The new way of growing and eating soybeans got rave reviews. For example: "Fresh soybeans had a satisfying flavor... They were delicious... We like them better than peas or beans... I served soybeans to all guests this summer and most everyone liked them... Everyone who tried them said they were splendid... We have never eaten beans as good... The beans were delicious to eat and were universally liked by my family and guests. In fact it took persuasion to leave any for seed." During the 1930s William Morse and the University of Illinois took the lead in popularizing both green-vegetable soybeans and vegetable-type soybeans in the USA. 1940 Dec. - Vegetable-type soybeans (Bansei and Jogun) are first offered for sale in the USA, by Strayer Seed Farms of Hudson, Iowa (Ad in Soybean Digest, p. 12). 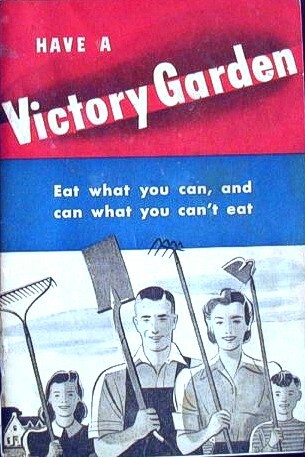 1941-1945 - During World War II, green vegetable soybeans are grown in Victory Gardens in the Midwest and at least six new canned products are introduced. By 1945 some 44 large-seeded vegetable-type soybean varieties have been named and released in the USA. 1944 Sept. - The first English-language advertisement for green vegetable soybeans appears in Soybean Digest (p. 61). Titled "Meet the vegetable cow," it is a full-page, black-and-white ad run by Dr. Harry Miller of the International Nutrition Laboratory, and a former student of Dr. John Harvey Kellogg. It shows the head of a cow made entirely from soybeans. The horns, forelock, parts surrounding the eyes, nostrils, and mouth are made of soybeans in their [green] pods. 1946 - The Japanese government (Ministry of Agriculture, Forestry, and Fisheries) starts keeping statistics on domestic edamamé area, production (weight including pods), and yield. In 1946 these figures were about 7,000 ha and 30,000 metric tons (tonnes). Yields peaked in 1969 at almost 10 tonnes/ha. In about 1982 both area (14,000 ha) and production (122,000 tonnes) peaked, then began a very slow decline as imports rose dramatically (Lumpkin & Konovsky 1991, p. 123). 1950s early - Varietal improvement of vegetable-type soybeans starts in Taiwan. In the United States, the period from 1935 to 1947 saw the first wave of interest in green vegetable soybeans and vegetable-type soybeans. But after World War II, interest almost disappeared. A second and even larger wave of interest began in the late 1960s and has continued to grow. 1966 July - Mr. Noritoshi Kanai, President of Mutual Trading Co. (MTC, Los Angeles, California), imports the first edamamé and the first frozen edamamé to the United States. They are imported from Japan and sold under Mutual's Miyako brand to local restaurants. Initially only two cases of 30 x 10.5 oz bags/case are imported as a trial. The company next imports frozen edamamé on 1 July 1970; during 1970 MTC imports 70 cases from Japan and again sells them to restaurants (Personal communication with Atsuko Kanai of MTC, June 2001). 1972 - Taiwan exports 472 tonnes of green vegetable soybeans, yet total area and production of these soybeans are negligible. By 1989 that figure had jumped 77-fold to 34,821 tonnes, with Japan buying 99% of the exports in frozen form. Japan's total consumption that year was about 160,000 tonnes - by far the largest in the world. 1982 April - Researchers at AVRDC in Taiwan [Shanmugasundaram et al.] publish their first two investigations on "immature green soybeans." 1982 - Rodale Research Center in Kutztown, Pennsylvania, publishes as excellent 25-page report titled "Fresh green soybeans: Analysis of field performance and sensory qualities," based on two years of research [May 1980 to Dec. 1981]. It identifies eight varieties found to be exceptional in both field and sensory qualities and gives the address of the seed company from which each can be purchased. Rodale Press (publisher of Organic Gardening & Farming magazine) also did pioneering work in introducing green vegetable soybeans to Americans, with at least 23 articles or books on the subject between 1962 and the present. 1985 - AVRDC in Taiwan starts research on mechanical harvesting of vegetable soybeans. 1987 - Reiko Weston, a Japanese woman who owns Fuji-Ya, a Japanese restaurant in Minneapolis, Minnesota, decides she wants to try growing edamamé in Minnesota rather than paying more for an imported product. The same business savvy that earned her the titles of U.S. and Minnesota 'Businesswoman of the Year' sparked research in 1987 by Jim Lambert of the Jameson-Williams Company into the viability of raising this new crop. Unfortunately, Weston died shortly before the first year's crop was harvested." Jameson-Williams steadily increases their production of edamamé from 7,000 pounds in 1988 to the 350,000 pounds in 1990. In Nov. 1990 Lambert describes Jameson-Williams as "the only commercial producer of edamamé in the U.S." He has experimented with hundreds of edamamé varieties. 1991 June - Yamato Flight Kitchen of Burlingame, California, starts serving edamamé on Japan Airlines flights from San Francisco to Japan. 1991 Aug. 5 - An article in the St. Paul Pioneer Press (Minnesota) states that Jameson-Williams' company name has been changed to Minnesota Edamame Co. The Nishimoto Trading Co. of Tokyo likes the taste and look of these green soybeans so much that they decided last week to place more than $100,000 worth of their bagging and packaging equipment in the Minnesota Edamamé plant. In September, Minnesota Edamamé will start using Nishimoto's equipment to ship 1 million pounds of partially processed immature soybeans to Japan. That's a big jump from the 7,000 pounds shipped in 1988. Minnesota Edamamé has contracts to supply Nishimoto with 3 million pounds of the soybeans from the 1992 Minnesota crop, 6 million pounds in 1993 and 15 million pounds by 1996. Unfortunately, quality problems in Minnesota prevented these rosy predictions from coming true. 1991 June - Yamato Flight Kitchen starts serving edamamé on United Airlines flights from San Francisco to Japan. 1991 April 29 to May 2 - The first international workshop / symposium on green vegetable soybeans is held at Kenting, Taiwan. The excellent proceedings, titled Vegetable Soybean: Research Needs for Production and Quality Improvement, were edited by S. Shanmugasundaram of the Asian Vegetable Research and Development Center (AVRDC) in Shanhua, Tainan, Taiwan. These are the first English-language proceedings and the first English-language book devoted to green vegetable soybeans. AVRDC has become a leader in research on green vegetable soybeans in Asia - in part because this crop has now become Taiwan's leading agricultural export, with most of the sales going to Japan. In these proceedings is an especially interesting paper titled "A critical analysis of vegetable soybean production, demand, and research in Japan," by Thomas A. Lumpkin and John Konovsky of Washington state; it contains extensive new information on the history of edamamé plus a superb bibliography of 187 references. In about 1986 Lumpkin founded the East Asian Crop Development Program at Washington State University (WSU), in Pullman, Washington. In the summer of 1989 he first grew a trial crop of edamamé (20 varieties); this was reported in a 1989 publication. By 1991 he is full-time head of a team of 12 people in this program, all of whom except himself are working part-time, developing East Asian plants - including edamamé - to be grown in Washington state. Lumpkin is interested (among other things) in documenting the history of various East Asian crops. He has collected about 400 varieties of edamamé; the germplasm is maintained at Pullman. 1994 April - The first bibliography devoted to green vegetable soybeans, with 489 references, compiled by Shurtleff and Aoyagi, is published by Soyfoods Center in Lafayette, California. 1994 May 27 - Tak Kimura ("Mr. Edamamé"), a food broker from Concord, California, introduces Eda Mame, America's first refrigerated, ready-to-eat edamamé - first sold at Whole Foods Market in Berkeley, California. 8 ounces of precooked, lightly salted green soybeans are packed in a plastic tray with a clear film lid by Yamato Flight Kitchen of Burlingame, California. In Oct. 1994 the first local supermarket to carry Tak's product was Mollie Stone's, an upscale supermarket with six stores in the San Francisco Bay Area. In Feb. 1998 Safeway supermarkets in Northern California become the first large supermarket chain to carry this product, again with Tak Kimura as the broker. By Jan. 2000 this edamamé product was served on United Airlines. Wholesale sales grew from $18,000 in 1994 to more than $540,000 in 1998. In 1998 the market for edamamé in the USA (especially on the West Coast) exploded! 1994 July 1 - Minnesota Edamame is renamed SunRich Foods. Their 1994 edamamé crop is a record 750,000 lb - but still not enough to meet demand. 1995 Jan. - Sweet Beans (SunRich Inc., Minnesota). 1996 Jan. - Freshlike Baby Broccoli Blend (with 40% green soybeans; Dean Foods Vegetable Co.). 1996 Dec. - Frozen Organic Sweet Beans (Sno Pac Foods, Inc.). 1997 June - Birds Eye Baby Broccoli Blend (Dean Foods Vegetable Co.). 1997 Sept. - Trader Joe's Edamamé (frozen in the pods, imported from China by Seaside Farms). 1998 Feb. - Cold Mountain Eda-Mame (Mutual Trading Co., Inc., frozen). 1999 April - Edamamé - Blanched Soybeans (retail or foodservice; Seapoint Farms, formerly Seaside Farms). 1999 Aug. - Melissa's Soybeans (Edamamé) (Melissa's World Variety Produce). 1999 Oct. - Edamamé (Frieda's, Inc.). 2000 May - Freeze-Dried Green Soybeans in Salsa, Indian Spice, and Sweet & Sour flavors (Eat Your Heart Out, New York; the first freeze-dried and the first flavored or spicy edamamé). In 1999 at least 8 new edamamé products were introduced, followed by 9 in the year 2000, and 5 more by May 2001. 2001 - The U.S. company with the most innovative and extensive line of edamamé products, the best and most colorful graphics (labels and ads), and the most extensive advertising, is Seapoint Farms of Huntington Beach, California, founded in 1997 by soyfoods pioneer Kevin Cross. 2001 July - At least 70% of the green vegetable soybeans consumed in the USA are imported, mainly from China or Taiwan. The two main U.S. growers are SunRich in Minnesota and Cascadian Farms in Washington state. A complete listing of The Soyfood Center's books and publications can be found Here.